The study of fish species at the old Portobello Marine Research Station in Otago Harbour. First published 1953 hardcover with colour dust jacket. 404pp. Size: 255mm x 195mm. Colour and Black and White photographs. “This profusely illustrated volume is the life-work of a scientific observer and investigator, and it is at the same time a fascinating book to read. Fishermen will agree that the subject provides endless pleasure by the fireside as well as in practice, and Mr Graham’s work is pre-eminently a fireside book.The author provides a wealth of information and anecdote which have come from the personal experience of a man who was in love with the hobby that became his profession. This book is The Compleat Angler for which New Zealand enthusiasts have long been waiting and, like that famous classic, it is a treasury of scientific observation and information in addition to the entertainment which is afforded in its pages. “This book is full of interesting observations made by the author particularly during his work early last century when he was appointed biologist to the Marine Fisheries Investigation Station, Portobello, in Otago Harbour. I find Graham’s book, although parts of it are now quite dated, to be both very readable and most enjoyable. He makes interesting statements such as “Elephant fish had a greater economic value during World War I than in 1930-34.” He tells many anecdotal stories such as the time a large ling was washed up on a Dunedin beach obviously having died because it had swallowed a large crayfish whole which had pierced its stomach! I also like Graham’s book because it has a strong southern New Zealand flavour resulting from his research work as a resident biologist operating mostly out of the Marine Fisheries Investigation Station at Portobello in the 1930s. The station had its own launch the Karoro skippered by an expert fisherman Mr Sid Broadley. Together the two men would go out together trawling, dredging and fishing in Otago waters. Graham would investigate the stomach contents of large numbers of fish from many species and make careful note of their diets at different times of the year. He would also bring back live fish, of different species, and place them in the outside concrete ponds at the Portobello station where their behaviours could be closely observed. From this, he was able to learn a great deal of information that would otherwise be difficult, if not impossible, to obtain. David Graham also investigated the stomach contents of many commercial caught fish as well. Here is a typical example. 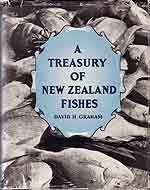 Keep in mind that David Graham covers some 140 New Zealand fish species in this 400 pages book. Then you get some idea of what a substantial volume of work this is. 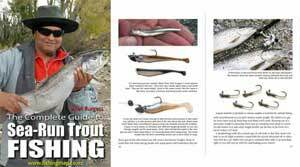 A Treasury of New Zealand Fishes is no longer available new. You will have to search around old second-hand bookstores for a copy. I got mine from Smiths Books in Christchurch some years ago. It was published in September 1953. My copy was in mint condition when I got it, signed by Graham, and dated October of the same year. I’m ashamed to say that my copy is now “scruffy” at best. So many times have I pawed through its pages the dust cover is a wreck. A timeless read, this book is a “must-read” if you are serious about learning as much as possible about New Zealand’s sea fish species.